Set the defaults on every SmartList object in the system, including custom-built SmartLists. 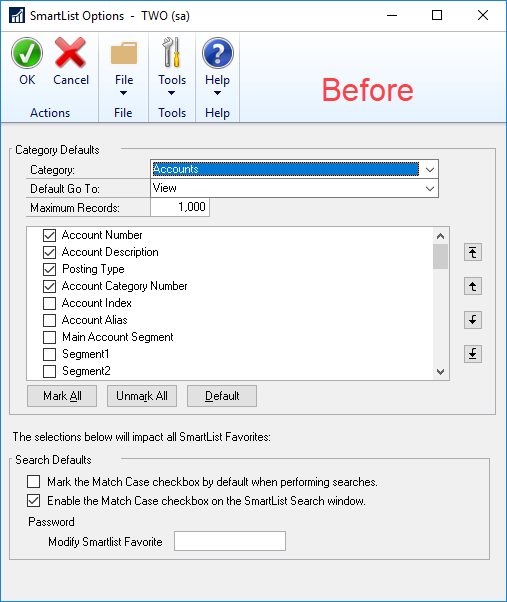 Set search defaults for Search in SmartList. Set a password for modifying favourites. This window is a System window, not Company-specific nor User-specific. What that means is any changes made here will affect that particular SmartList object across every company and for every user. Specifically, you are setting the defaults for the * default option that is on each SmartList. Nothing you do in this window will affect existing favourites that are saved. For example: setting the default max records to a higher number won’t update existing saved favourites, but will be the default for new ones. Here is what the SmartList Options window looks like, before I made a few changes on the Accounts SmartList object. 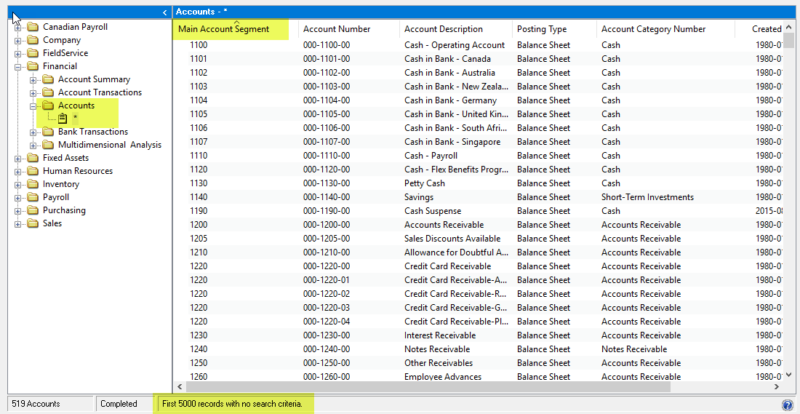 By default, this list shows 1,000 accounts and 4 fields – Account Number, Description, Posting Type and Category. Starting at the top of the window, the Category drop-down list is the list of SmartList objects. A SmartList “object” is the “yellow folder” level of the SmartLists you see in the list of SmartLists. So, Accounts, Customers, Vendors, Payables Transactions, Account Transactions etc. The level under the object is where users can save “Favourites”. Start by selecting a SmartList object from the drop-down list. One thing to beware of, the list is (seemingly) in a random order! If you have a lot of custom SmartLists, you will likely find it hard to find them as they don’t appear to be in either order of date created nor alphabetical, but they will be there somewhere! Next drop down list is the Default Go To option. The out of the box SmartLists have (typically) more than one option on the Go To menu. For Accounts, for instance, the default is View (open the Account Maintenance window) but there are options to open the Summary Inquiry window or the Detail Inquiry window. The default Go To is the one which is used when a user double-clicks on a record in a set of SmartList results. You can’t add new Go To’s here, but you can change which one is the default for that particular SmartList object. 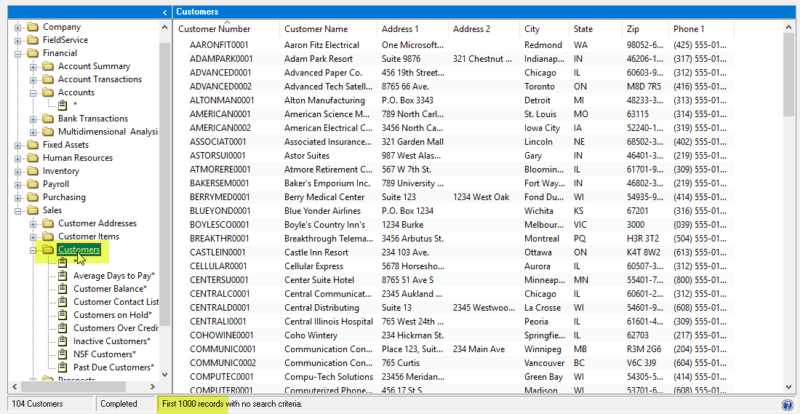 The third field on the window is the maximum records setting for this object’s default SmartList. Every default is 1,000 but it’s definable for every single object. You may want to a different default maximum for different SmartList objects. The best number to set will depend on how that object is used across the various company databases, there is one “perfect” value to set this at. Next in the window are the default fields for the SmartList object. Here you can alter the position, the name, and which fields are visible by default on the * default for the object. Editing the display name is as simple as clicking in the field and typing over the name in the list of fields, like you can in the Columns chooser window in SmartList itself. Clicking on the Default button will reset the object to the default order, name and fields that were out-of-the-box. The Search options at the bottom of the window are around case-sensitivity. The first option is identifying if this SmartList should have the Match Case box ticked by default. The second is whether that choice is enabled at all. The password option – this screenshot is from GP 2016 when this was first added – and it’s about setting a password to control who can modify a SmartList favourite. In GP 2018, this feature was modified so you could have a password at a SmartList favourite level instead of one password for the entire system. I made a few changes and here’s an example of what it looks like afterwards. I increased the max to 5,000 records, marked a few new fields and moved the Main Account Segment field to the first/left field. After clicking on the Category drop-down list, I was prompted to save my changes. I could simply change the Category to another SmartList object and save as I go, making changes to multiple SmartLists as I like. I’ve highlighted the obvious places where the changes I made are visible. My Main Account is now my first column, and my max records is 5,000. By comparison, here is the Customers SmartList where the default max is still 1,000, because I did not modify that particular object. That’s it for this particular tip. I find this to be a very useful window, especially when adding new smartlists if you want to set a different default maximum number of records. If you have SmartList Builder, you can set the column order and Go To’s in the product but when you don’t or you want to make tweaks to out of the box SmartLists, this is a great window to know about.